The Sacramento-San Joaquin Delta is home to a diverse community of plants and animals and is the hub of California’s freshwater delivery system. The Delta supplies water for over 25 million Californians and supports millions of acres of farming, commercial and sport fishing, shipping and ports, and recreational boating. Invasive aquatic vegetation (IAV) – dominated by Brazilian waterweed, water hyacinth, and water primrose – has increased exponentially in recent years, clogging about 17,400 acres of waterways across the Delta. These invasive plants create safety hazards for boaters, and obstruct navigation channels, marinas, and irrigation systems. These aquatic plants also act as "ecosystem engineers", altering water flows through the Delta, water temperature, and the amount of oxygen and nutrients in the water. IAV also affects how sediment in Delta water is transported. Sediment affects how clear or cloudy the water is – how "turbid" it is. Reductions in turbidity may be impacting the quality of fish habitat. Adequate turbidity levels are required for proper feeding of endangered fish such as Delta smelt – which, because of environmental protections, affects water management and water deliveries to farmers and communities. In addition, IAV may be blocking deposition of sediment (accretion) across marsh plains. Sediment accretion is essential to protect marshes against predicted sea-level rise. Total eradication of these invasive plants from Delta waterways is unlikely because they have spread too widely. The purpose of this project is to provide critical information about the impact of invasive aquatic vegetation on fish habitat and the health of marshes to agencies that manage and control IAV in the Delta, including the California Department of Fish and Wildlife, Division of Boating and Waterways, and Department of Water Resources. We will accomplish this goal by measuring the impact of invasive aquatic vegetation on sediment transport, turbidity, and marsh accretion rates in the three environments of the Delta: channels, dead-end sloughs, and flooded islands. This study will be the first of its kind to address these research questions in a quantitative fashion. 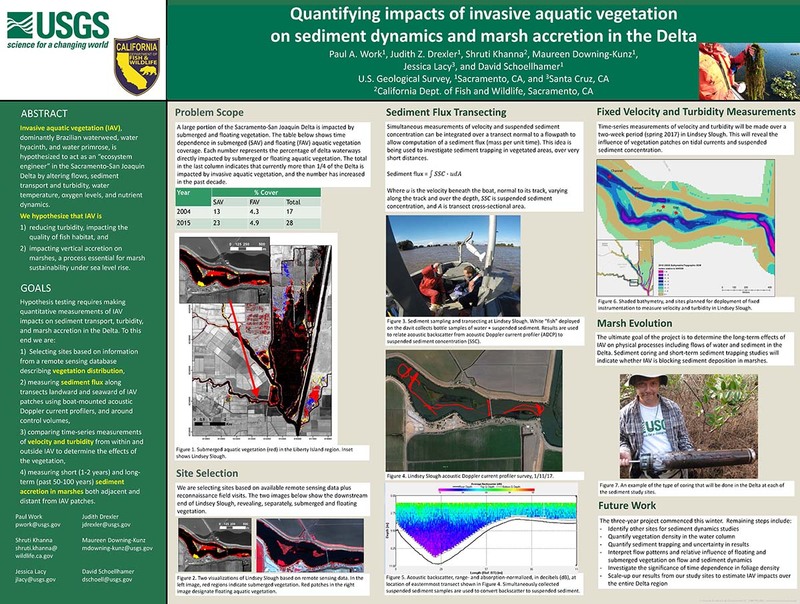 We hypothesize that (1) IAV is reducing turbidity to such an extent that it is affecting the quality of fish habitat in the Delta and (2) IAV is blocking the delivery of sediment, which is needed to maintain marsh elevation as sea-level continues to rise. 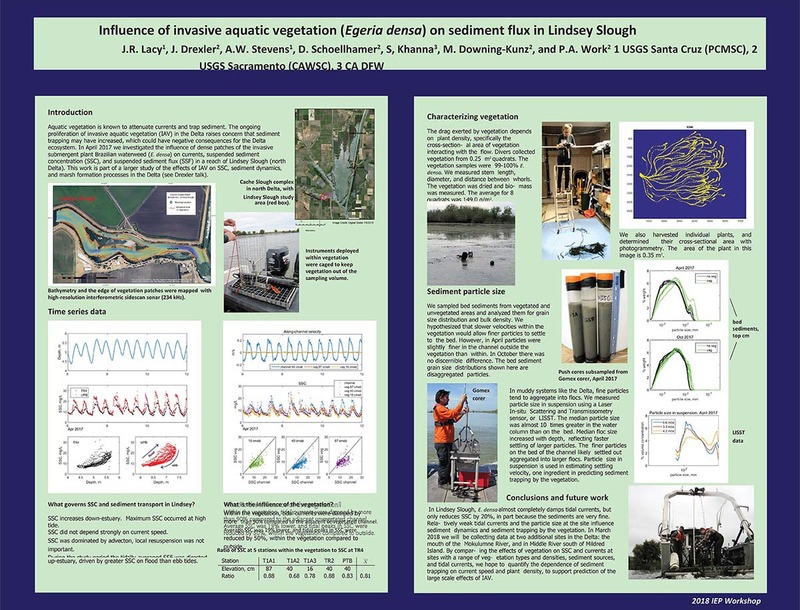 In the first year of this three-year study we will refine our methods for quantifying sediment trapping by IAV. To do this, we'll measure the sediment trapping ability of vegetation during both winter and summer in a range of IAV patches, choosing those that best resemble invasive Delta species assemblages and patch sizes. We will use two different approaches for sampling: (1) measurements along transects landward and seaward from IAV patches using boat-mounted acoustic Doppler current profilers and (2) fixed instrument deployments using a combination of Doppler velocimeters and short-range acoustic current profilers, both within and outside of patches. In addition, we will also measure both short (14-day period) and long-term (past 50-100 years) sediment accretion in marshes both adjacent and distant from IAV patches. These measurements will be used along with Delta-wide remote-sensing data showing the distribution of IAV to estimate the total amount of sediment trapped by IAV in the Delta (the sediment sink). This sediment sink estimate will be compared to past and current measurements of suspended sediment concentrations in Delta channels to quantify the role of IAV in the recent decline in turbidity throughout the Delta. In addition, the sediment sink estimate will be compared to sedimentation rates in marsh soils to determine whether sediment deposition in marshes has declined concurrently with the exponential increase in IAV. Project results will be published online and freely available to the public. Invasive water primrose (Ludwigia species) and water hyacinth (Eichhornia crassipes) line the marsh edge in Mandeville Cut near the Port of Stockton, California’s third largest port. Photo: USGS. Invasive aquatic vegetation chokes Lindsey Slough, creating a potentially challenging environment for fish and other aquatic life. The slough is the site of a 2014 restoration project to improve freshwater tidal marsh and spawning habitat for Delta smelt and other fish. Photo: USGS. Landscape ecologist Shruti Khanna uses a threshing rake to collect Brazilian waterweed (Egeria densa) in the Delta. The USGS is conducting research to measure the impact of invasive aquatic vegetation on sediment transport, turbidity, and marsh accretion rates in Delta. Photo: USGS.